Coming toward the end of the day of BUCS Big Wednesday 2018, we have our final GreenandGold team battling it out to claim BUCS gold! The University of Nottingham Women’s Table Tennis 1s started their preparation for their final match at 7pm in David Ross Sports Village against Durham 1s. The first game saw Letitia McMullan take on Megan Phillips. UoN get off to a strong start going up 3-0 early. Durham manage to get a few points in but UoN continue to extend their lead. Letitia stayed on top throughout the rest of the first set winning it 11-7! Durham came back stronger in the second looking a little more confident and won the 2nd set 11-6! It was followed by a close 3rd set with not much separating the players, Durham eventually won 12-10 making it 1-2 to Durham. and they went on to land victory at 1-3. The next pairing to match up was Yolanda King and Angharad Phillips. Yolanda won the first set 12-10 after a close fought game where there wasn’t much separating the two until the last few plays. The second set saw Durham come from 4-2 down to lead 8-4, winning 6 points in a row, eventually winning 11-5! (1-1) Durham then extended their lead in the third set making it 1-2 overall. Durham tried hard to get back into the match but Yolanda held her ground and managed to win the 4th set 11-8 taking it to a deciding last set. There was now a crowd building in the salle as all other matches (apart from the Men’s table tennis final) for BUCS Big Wednesday had already reached their conclusion. The fourth set was a tense affair and close throughout. It was only after impressive play from Angharad that the sides were seperated and Durham took home the victory with a 11-7 win making it 2-3 Durham. Next up, we had the doubles with Durham build a strong lead early on during the first set. Afer being behind 7-2 UoN raced back to make it 9-8. The set now hung in the balance and neither team looked like taking the initiative when they went ahead.. The next few scores went Yo-Yo’d back and forth 13-13, 14-13, 14-14, 14-15, 14-16, with Durham’s Megan Phillips finished the game off with a strong shot across the table to win the set! Durham controlled the second set throughout and made it 2-0 overall. UoN were hoping to get something back in the 3rd set with a strong start but Durham were just ahead at the end at 9-7. Durham’s confidence and momentum stayed high as they extended their lead to 10-7 and finished 11-7 completing the match and winning the Championship in style. 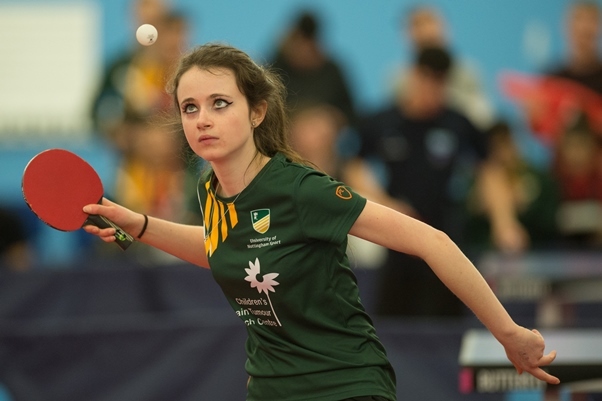 It wasn’t the Green and Gold night that everyone had hoped and despite a valiant effort from both Letitia and Yolanda, Women’s Table Tennis’s fell to their first defeat since February 2015.